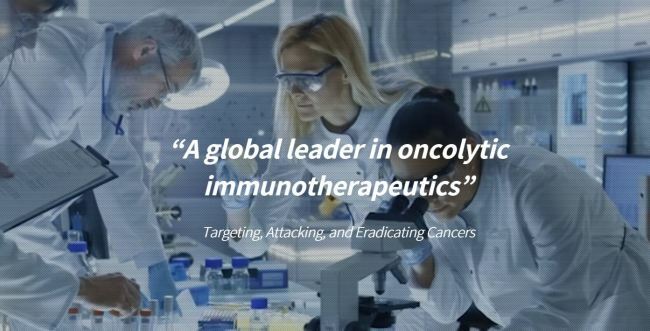 SillaJen said Wednesday it will utilize 110 billion won ($97.3 million) worth convertible bonds that it plans to issue for testing the efficacy of its breakthrough oncolytic virus Pexa-Vec for various types of cancer, as well as develop another pipeline. The South Korean firm also seeks to establish a new research and development center in the capital region, for which it plans to hire more researchers. A day earlier, SillaJen made a public disclosure that its board of directors has decided to issue the biggest amount of convertible bonds ever taken out by a Korean biopharmaceutical company in a single count. The bonds will be issued by Kiwoom Securities. The fresh procurement of assets pushed up company shares on the secondary bourse Kosdaq Wednesday morning, which began trading at 68,300 won, up 2.55 percent from a day before. With the new funds, SillaJen will carry out clinical trials of its cancer-fighting pipeline Pexa-Vec, and its joint use with other immune checkpoint inhibitors. The firm will carry out extensive research of Pexa-Vec’s efficacy in treating liver and breast cancer. The firm will gradually test out the effects of Pexa-Vec on head and neck cancer and neuroendocrine tumor, with the aim of developing best-in-class and first-in-class treatments for areas of unmet patient needs. SillaJen anticipates its research will lead to expansion of its cancer-fighting pipeline and eventually more out-licenses. Licensing out novel drug candidates and development technology is a common way for biopharmaceutical firms to secure more funds. SillaJen said its board of directors has agreed on a long-term vision that the convertible bond issuance now will contribute to future growth of its valuation. Pexa-Vec’s phase 3 clinical trials and joint clinical trials with US’ Regeneron for renal cancer are being carried out from existing pool of funds, which the company estimates to be approximately 113 million won at the end of December 2018. SillaJen will receive digital votes from shareholders by 5 p.m. on Tuesday for its future agendas including the appointment of two new executive directors, three new non-executive directors and a new auditor.